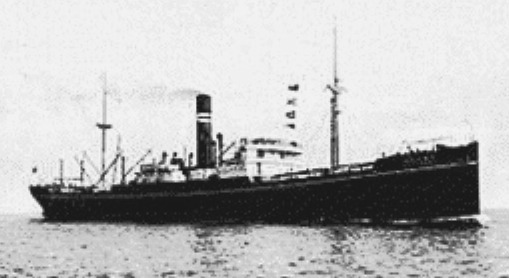 In 1920, WEST IVAN (later NIKKIN MARU) was completed as a cargo ship for the United States Shipping Board Merchant Fleet Corporation. In '42, NIKKIN MARU was confiscated by the Japanese at an unknown location, possibly the Philippines. Thereafter, she was requisitioned by the Imperial Army (IJA) as a Haitosen Army/Civilian (A/C-AK) shared employment cargo ship. In ‘44, she was sunk by an American submarine. Year Completed: J. F. Duthie & Company, Seattle, WA. Dimensions: 410'3" (LPP) x 54'2" x 27'7"
Propulsion: Steam turbine, 359 n.h.p., single screw.